A study using recordings of 615 Swamp Sparrows found that the species must have been singing the same song with little variation for 1,000 years. Data collected through eBird is showing where sister species come into contact with each other and interact. More Atlantic Puffins than usual are nesting at Skomer Island this summer, but numbers in most other places are in decline. Open the Chesterfield reefs to cruise ship tourism could endanger the reefs and the nesting seabirds that depend on them. Protecting the remaining reefs is important since most are struggling to adapt to climate change. A new paper combines written observations and museum specimens to create a more complete estimate of the Carolina Parakeet's range. 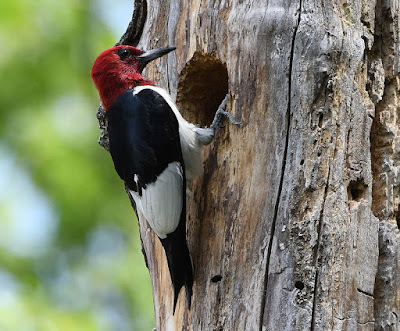 Better habitat management makes national historical parks like Antietam National Battlefield and Manassas National Battlefield Park fruitful locations for birds and birding. Scientists found Mexican Spotted Owls roosting near a mining operation that was set to expand. A new organization is working to protect Colombia's shorebirds. Funding for the conservation of endangered parrots in Australia is mostly coming from NGOs because the government allocates so little for the effort. Twitter user @albertonykus has an informative thread on swifts. During its renovations, Cambridge University's zoology museum found feathers that may be from a moa. A 3-week-old Osprey chick had to be disentangled from a balloon while in its own nest on Barnegat Bay. Warmer sea surface temperatures make survival harder for young Black‐browed Albatrosses. Arctic sea ice nearly reached a record low for May, and climate scientists are concerned about the effects the thinning ice will have on the world's weather. The USDA suggests using a wood chipper to destroy Spotted Lanternfly egg masses. This invasive insect is spreading in Pennsylvania and nearby states. The Trump administration is considering changes that could weaken the National Environmental Policy Act. A study at Los Alamos confirms that invasive beetles expand their range during warmer winters. Bogong Moths sense the Earth's magnetic field and migrate using that and visual landmarks. New Jersey now has an official state reptile, the state-endangered Bog Turtle. A group is raising money to help fund Bog Turtle conservation. The Association of Fish and Wildlife Agencies has issued a plan for rapid response to Bsal, a fungus that attacks salamanders, even though it has not invaded yet. New Jersey is warming faster than most other states, with temperatures in all regions of the state rising over 2°F in the past thirty years. 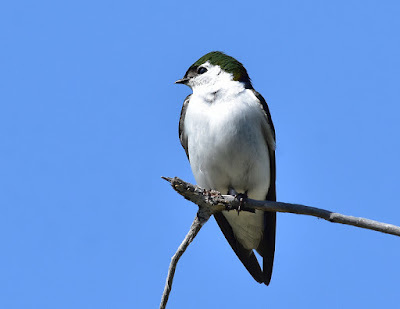 Audubon sent reporters to cover three teams competing in New Jersey Audubon's World Series of Birding: one adult team, one youth team, and one big sit team. The article is pretty good, but birds that only part of the team sees or hears are not "dirty birds" as the authors say repeatedly. The rules just limit the number a team can count. A study of songbirds in Missouri found that habitat restoration (including the use of controlled burns) leads to more successful nesting. Toxins in marine mammal carcasses might be why coastal California Condors produce fewer offspring than inland condors. 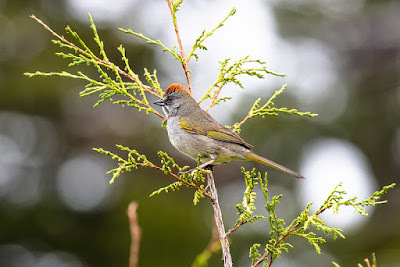 Australia's most threatened species, like the King Island Scrubtit and the King Island Brown Thornbill, are monitored mostly by volunteers because of a lack of funding for conservation agencies. Over the past forty years, average daily temperatures on New York’s Whiteface Mountain have risen 3°F and birds have moved 270 feet up the mountain from their previous ranges in response. The US Fish and Wildlife Service is looking for reports of banded Piping Plovers. Birding New Jersey: How Many Waterthrushes? The rate at which Antarctica's ice melts has doubled over the past five years, so that a sea level rise of six inches is likely by the end of the century. The loss of ash trees to the invasive Emerald Ash Borer affects the production of baseball bats. A report argues that the UK could meet most of its plastic needs by recycling used plastic domestically instead of shipping most of it abroad. Painted Ladies have the longest recorded butterfly migrations, from sub-Saharan Africa to the Mediterranean. The state of Washington will have to fix faulty culverts that block fish from migrating to their breeding grounds. A project is underway to create wildlife crossings along I-90 in Washington. Scent lures will help determine the size of Alberta's grizzly bear population. President Trump is the first president since 1941 not to name a science advisor, and the lack of scientific expertise in his administration extends well beyond that. The UK's annual Moth Night is taking place this weekend, June 14-16, with an emphasis on the family Pyralidae. Red-shafted and Yellow-shafted Flickers are extremely similar genetically, but new techniques show some small genetic differences that may account for their differences in plumage. Scientists used genetic data to identify which mating grounds were most important for allowing genetic exchange among different sage grouse populations. 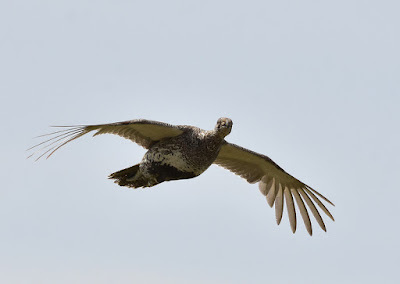 Robotic taxidermied birds (clothed in the feathers of road-killed sage grouse) are helping scientists study sage grouse mating behavior, including how grouse choose mates. Encouraging raptors by installing perches and nest boxes or platforms can reduce the activity of rodents. Atlantic Puffins are in decline, and reductions in their food supply thanks to rising ocean temperatures is a major cause. Climate change is also blamed for the die-off of hundreds of thousands of Cassin's Auklets in the Pacific Ocean during a warm spell from 2013-2015. A survey across Botswana found that many birds of prey and vultures are in decline, some by as much as 80%. While Herring Gulls appear common, their numbers in Great Britain declined by more than half from 1970 to 2002 — and surveys have not been updated since then. A lot of other seabirds like terns and kittiwakes are not doing well either. Birds with blood parasites lag behind other migrating birds. Farmland birds are among the most threatened birds worldwide. Natural Newstead: From multicolor to boodang! There are 3.4 million acres of primary forests left in Europe, mostly scattered in small tracts that still provide important habitat for some wildlife species. Most have some sort of protection, but more than half lack protection from logging. A program to save Northern Quolls by moving them to toad-free islands made the quolls lose their fear of predators like Dingos. Of the 200,000 protected areas around the world, around one-third no longer adequately protect the plants and animals they were created to sustain, primarily because of human pressure. Here is an interview with a scientist who studies krill, an important part of the marine food web. Environmental groups are urging the Murphy administration to set as low of a cap as possible on carbon emissions when New Jersey finally rejoins the Regional Greenhouse Gas Initiative in 2020. Paved surfaces contribute significantly to flooding downstream, as happened in the Ellicott City flood. In Appalachian, tap water is often unsafe to drink because of contamination from coal mining and other industries. The butterfly Mimeresia neavei generates its blue coloration via simple structures in its wing scales. A study finds that butterflies benefit from controlled burns. Many wetlands on the West Coast will not be able to migrate inland as the sea rises. This week, a group of observers at Tadoussac in Québec recorded 700,000 migrating warblers, including over 100,000 Cape May Warblers, over 100,000 Magnolia Warblers, and over 100,000 Bay-breasted Warblers. Their eBird checklist is extraordinary. Google maintains feeding stations for feral cats on its Silicon Valley campus, which in turn threatens nearby populations of Burrowing Owls. Common Pochards are among the many birds threatened by eating lead shot left over by hunters. Most alcids (and seabirds generally) migrate, but Whiskered Auklets stay close to their breeding colonies during the winter. The flightless Wake Island Rail became extinct as a result of World War II. Like many thrushes, Swainson's Thrushes have an ethereal song. Parasites make it harder for European Shags to fly and forage for their chicks. Western Snowy Plovers were spotted nesting at Clatsop Spit in Oregon for the first time since the 1980s. Toronto is warned park visitors to be careful of aggressive nesting Red-winged Blackbirds. A recent study tested why older male sparrows have more extra-pair offspring, and the results were inconclusive. Here is a Common Eider hunting underwater. The Peregrine Falcon chicks from the nest at 101 Hudson Street in Jersey City were banded this week. The chicks were originally from a nest on the old Goethals Bridge, which is being demolished, so they were transported to be fostered by the Jersey City pair. Beetles In The Bush: When is an ant not an ant? When it’s a jumping spider, of course! Numerous strands of evidence suggest widespread and precipitous declines of insects. The causes of these declines are unclear, but pesticide use seems to contribute. One obstacle to insect conservation is that so little is known about so many of them, including many of North America's native bees. China's ban on importing certain types of waste materials has led to a drop in how recycled material actually gets recycled. Expanding the border wall will harm biodiversity on both sides of the border and discourage the ecotourism that the region's economy depends on. Meanwhile Ryan Zinke claims that militarizing the border will protect the environment when all evidence points to the contrary. This week, a study showed that more than 4,600 deaths in Puerto Rico could be attributed to Hurricane Maria; the island's infrastructure has not been rebuilt safely and is likely to collapse in another storm. There is a new website on the moth family Sphingidae, also known as hawk moths or sphinx moths, with information on identification, host plants, parasites, and more. Ellicott City in Maryland suffered severe flooding this week, and the flooding seems to be a combination of an unusual (and possibly climate change-fueled) weather pattern and rapid real estate development upstream. For more, see this post about a previous flooding event in that city. Treating clothing with permethrin seems to stop most ticks that carry diseases. When stick insects are eaten by birds, some of their eggs pass through the bird unharmed and later hatch, which may help the insects with dispersal to new habitats. The New Jersey state legislature is considering whether to impose a ban or tax on plastic bags. A study found the the Raritan and Passaic Rivers in New Jersey are full of microplastics. The Murphy administration decided to cancel the proposed marina on the south end of Liberty State Park in Jersey City. The marina was a priority of the Christie administration, which wanted to monetize Liberty State Park, but opposed by local activists and environmentalists.